A few showers early becoming a steady rain for the afternoon. Thunder possible. High 46F. Winds E at 10 to 20 mph. Chance of rain 100%.. Rain ending early. Remaining cloudy. Low 36F. Winds NNW at 10 to 15 mph. Chance of rain 100%. Rainfall around a quarter of an inch. Jacalyn Kae (Jackie) Davis passed away peacefully Saturday, Aug. 11, 2018, with her family by her side after a courageous battle with pancreatic cancer. Jackie was born March 19, 1952, in Menomonie, to Earl and Lorraine (Kerg) Johnson, the first born of a set of twins. 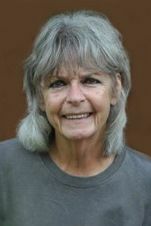 She was a 1970 graduate of Menomonie High School. After graduation, she found employment at West CAP and Sandy Lee Mfg., in Menomonie. In 1992, she was employed by Cardinal Glass in Menomonie, where she worked for 23 years,taking her to retirement in 2015. In September of 1978, Jackie married her long-time love and soul mate, Daniel W. Davis. Together in this union, a daughter, Shawna Rae, was born. Jackie’s passion growing up was horses and she raised many. Gardening was a hobby she shared with Dan. Together, they worked to provide for themselves, sharing with family and friends. She also loved to entertain. Making others happy brought her great joy. But her greatest joy of all was the birth of her grandchildren. She loved them “to the moon!” They were her source of entertainment and brought her much happiness and love into her life. Jackie is survived by her husband of 40 years, Daniel; their daughter, Shawna (John) O’Meara; sisters, Judy Thatcher and Patti Thibado (Mark Harris); brother, Dale (Pat) Johnson; mother-in-law, Corrine Stockman; sisters-in-law, Dorinda (Warren) Helgeson, Dayna (Kevin) Grant; and brother-in-law, Dean (Tracy) Davis; grandchildren, Aidan, Dane, Brynn and Brandt O’Meara. Also nieces, nephews and many great and special friends. She was preceded in death by her parents; father-in-law, Daniel C. Davis; brother-in-law, Dale Davis; her twin sister, Jeanne Witt; and her son, Devon Shackleton. Funeral services will be held at 11 a.m. Friday, Aug. 17, at Alliance Church in Menomonie with Pastor Doug Stolhand officiating. Burial will be at Forest Hill Cemetery in the town of Stanton, Dunn Co., Wis. There will be visitation from 5 to 7 p.m. Thursday, Aug. 16, at Olson Funeral Home.